I havent tried Bush’s Grillin beans but I will def try Steakhouse Southern Pit and Texas Ranchero would be to my husband’s liking. Just the other day I marinated chicken in Worcestershire sauce/orange juice and rosemary/garlic seasonings….OH MY what flavor!! You are in for a treat Piper. They are so good! I hope you enjoy trying them! One of my favorite kitchen tools to use during the summer is not actually in my kitchen. Any guess what it is? It is my grill. I love my grill and we use it several times a week at our house. I would say during the summer we use it several times a week, but really we grill almost all year long, not just during the summer. We love to grill when we have company over, or for a holiday cookout, but the reality is that it does not take a special occasion or holiday for us to grill. We grill all the time. And by “we” grill, I really mean we. I “man” the grill just as much as my husband at our house. My husband loves to spend time grilling and getting his steak or hamburger just perfect. When I grill though I am all about quick and easy. Does that surprise you? Yeah probably not, since quick and easy recipes are pretty much all I make. 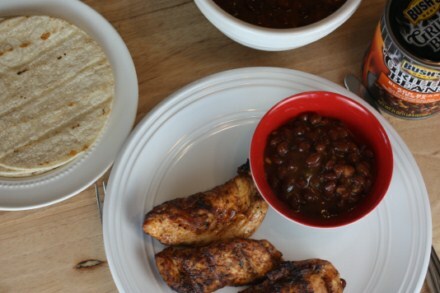 Today I have a quick and easy southwest grilled chicken for you that my family loves and I love how easy it is to make and grill. I make these as chicken strips, because they cook a lot faster that way, but really you could use this same marinade on any type of chicken and just adjust the cooking time. 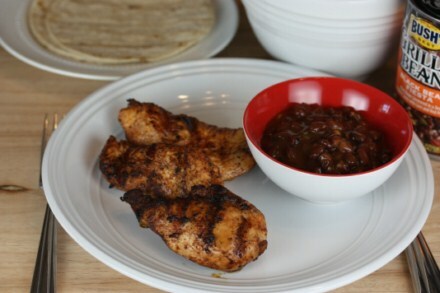 This chicken goes perfectly with Bush’s Black Bean Fiesta Grillin’ Beans. The slightly spicy flavor of the beans pairs perfectly with the chicken, add in some tortillas you will have a meal your family will love. 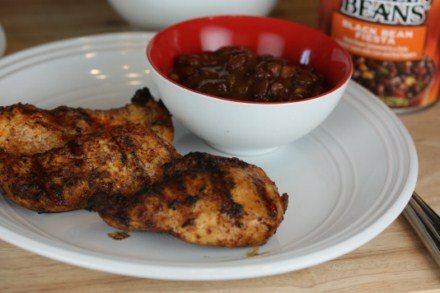 And not only do I have a great grilling recipe for you today, I have a great giveaway from Bush’s Grillin’ Beans for you. All you have to do to enter is leave me a comment, but I would love to hear what your favorite flavor of Bush’s Grillin’ Beans is. And if you have a favorite way or recipe to grill chicken, steaks, or chops please share that as well. I am always looking for new and fun grilling recipes and ideas. Giveaway will end Monday August 20, 2012 at 6 pm CST. If you are reading this by email you must click here and leave a comment on my site. For more giveaway information please see my giveaway policy. In a large ziptop bag or a shallow pan, combine the first seven ingredients and mix well. Add chicken and marinade for 2-4 hours. Turning once or twice to cover well. Remove chicken from the marinade and cook on a grill that has been preheated to medium high heat. Cook for 4-6 minutes per side or until done. Quickly lay tortillas on the gril for about 30 seconds per side. This is just enough to heat them up and brown them slightly. 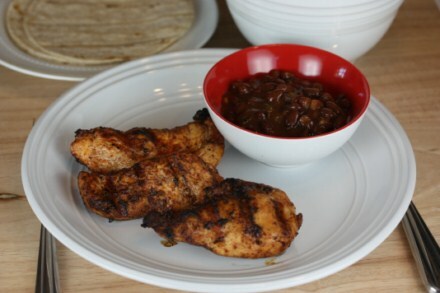 Serve chicken strips on tortillas with Bush’s Black Bean Fiesta Grillin’ Beans on the side or on top. Disclaimer: I have an ongoing relationship with Bush’s Grillin’ beans and am compensated for my time working with them, however my thoughts and opinions are my own. Bourbon and brown sugar, hands down… who knew the humble bean could be so decadent?!? I would love to win this giveaway since I enjoy a quick & tasty meal after working all day. I have never tried the Bush’s Grilling Beans. Hope to win so I can try them. I love to cook naked chicken strips on the grill in bulk. I use salt and pepper only. I then freeze them and have quick kid meal ( instead of processed chicken nuggets) or chicken to dice up for things like pizza. I haven’t yet tried the Bush’s grilling beans, but would like to try the Black Bean Fiesta. They sound nummy. We are trying this recipe tonight! When it comes to Bush’s beans we like to mix it up. No particular favorite just want sounds good when we are at the store. Thanks for the give away! I do not think the family has a favorite flavor of Bush’s Grilling Beans but we would like to be able to try more flavors of them. We usually grill things plain and then let each person add their own flavorings as they desire. I love Bush’s Grillin’ Beans. Your chicken looks awesome. I will have to make it sometime soon. Thanks for the chance to enter. That chicken looks so yummy! We have been liking the new sweet mesquite Bush’s Grillin Beans lately. Thanks for the chance to win! I really like the new Sweet Mesquite flavor! What do ya mean what’s my favorite Bushs bean flavor, I luv ’em all, especially on hotdogs! Luv bbq whole pork loin, rubbed & sauced! Leftovers? Pulled pork sammies, YUM! My go-to marinade with chicken is low-sodium soy sauce, honey, grated ginger, chopped garlic & olive oil. I let it marinate for 2 hours or up to 2 days. My husband grills on real charcoal with soaked hickory chunks on top. After the chicken is grilled and rests I slice each breast thinly across the grain and top with Bush’s Black Bean Fiesta, tomato, onion and cilantro. OMG! It’s good! We like all the Bush’s products that we have used. I like the traditional baked beans better than any of the new products. Any meal cooked outside on the grill is great for me. I just love being out in the fresh air and it makes everything taste better. 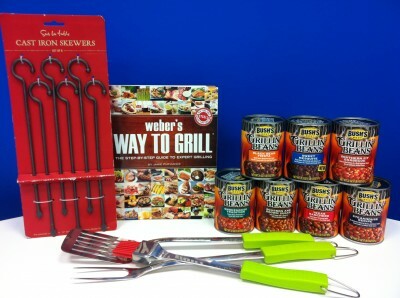 We love beans of all kinds – would love to win! Awesome giveaway! I love Bush’s homestyle baked beans. The Bourbon and Brown Sugar beans are by far the favorite at my house! I’ve only tried the original. I’ve only tried one kind of Grillin’ Beans. It was made with black beans, which I did like. Ya know, now that I think about it, I don’t have a flavorite. But my favorite thing to grill is salmon. I do like grilled chicken thighs that are basted with Hunt’s Brown Sugar BBQ sauce while cooking. Have never tried them, but would love to! I prefer their Homestyle to the Grilling Beans but all of their products are good. I like the Black Bean Fiesta. I usually dip my tortilla chips in it, or make a plate of nachos with them. Thank you for the contest! We love baked beans at our house, actually any type of bean. I was just looking for a recipe to make for company this weekend and this looks great! Thank you for sharing. I love ALL baked beans, and Bush’s are the best! Mmmm… Chicken looks great. We love grilling in the summer! I love the Sweet Mesquite flavor. My favorite flavor is Homestyle. We love to add MORE flavors and play with them. If I don’t have time for it, then it’s great without adding anything! I’ve never had any of the Grillin’ Beans so I can’t tell you my favorite flavor of them. But that recipe for grilled chicken strips sounds delicious! I’ll have to try it once we get a new grill. Bourbon and brown sugar are so flexible they go with everything. I love the smoky sweet flavor, reminds me of summer and family get togethers. Bush’s Southern Pit BBQ beans are my very favorite! As far as BBQ’ng chicken, I usually just use an over-the-counter BBQ sauce with maybe a dash of hot pepper sauce. I so love Bush’s Grilling Beans. Here in SC it’s been too hot to grill outside, but I have a small electric grill I can use for recipes like the one in this post which do not need a large grilling surface. I’m going to try it this evening when DD2, her hubby and my only DGS come over. I would like to win the seven cans of Bush’s beans as an easy way to try all the flavors. I haven’t tried them yet. We like the Mesquite flavor! I have the problem of not knowing which to choose and then forgetting which one we like best too. Would love to win this! I love Reading your blog and trying all the great recipes!!! I have never tried the Buch’s grilling beans but I’d love to!!! I like Sweet Mesquite Grilling Beans. I don’t have any special recipes for grilling, we just use a good barbecue sauce. We really like all Bush’s beans. Would like to try some of the other flavors of the Bush’s Grillin’ beans. I have actually never tried them but I am SOOOO going to pick up a can or two the next time I am at the grocery store, they look really good!! I think I’ve only ever had original.